Some people adopt renunciation because of frustration. They want some worldly thing that they believe is enjoyable, but on failing to get it, they adopt the renounced order. However, such renunciation can’t get them out of illusion because it arises from an illusion. What is that illusion? The illusion that life’s pleasure and purpose center on gaining worldly things. The Bhagavad-gita explains that we are souls, parts of the all-attractive Supreme, Krishna. We can find the greatest happiness by loving and serving Krishna. Learning to love him is life’s ultimate purpose. Renunciation is meant to help us free us from obsession with worldly things, thereby facilitating our absorption in Krishna. However, when we renounce out of frustration at our inability to gain worldly things or out of fear of the labor involved in getting those things, then we are still under the illusion that those things are enjoyable. Because of that illusion, even if we externally adopt the garb of a renouncer, internally our consciousness will still keep gravitating towards worldly objects. Not only will we stay materially captivated, but also we will keep looking for some opportunity to enjoy those objects without laboring for them. 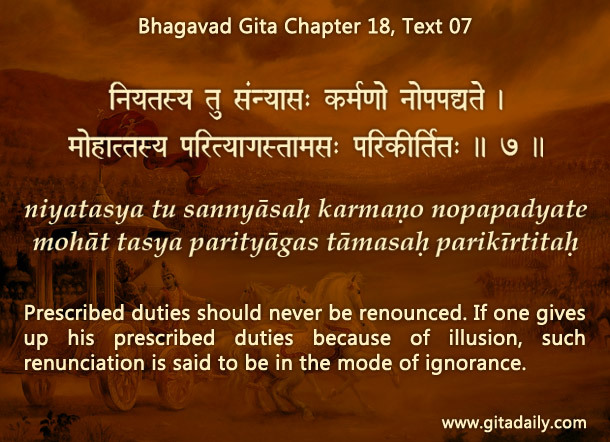 The Bhagavad-gita (18.07-08) cautions that such self-serving renunciation is in the lower modes of material nature. Far from helping us come out of illusion, it will incriminate us in further illusion – the illusion that we are renounced when we aren’t. Therefore, when we face frustration, rather than rushing to renounce, we can focus on gaining higher insight by studying the Gita and higher taste by practicing bhakti-yoga. With our illusion thus decreased, we can understand ourselves, thereby discerning how we can raise our consciousness from its present level to the level of joyful absorption in Krishna. How may our renunciation arise from illusion? How can renunciation increase our illusion? How can we respond to frustration wisely?